Are there any saltwater rivers on Earth? I'm curious if there are any saltwater rivers on Earth. These would presumably arise if a saltwater lake had a river outlet to the ocean. However, all the saltwater lakes I looked at (Caspian Sea, Dead Sea, Great Salt Lake Utah), apparently don't have any river outlets. Do any exist? And the obvious follow up, why or why not? Edit: For the purposes of this question, undersea flows don't count. They are fascinating, but I'm interested if any "regular surface rivers" exist as saltwater rivers. The water in any river draining the sea is infinitely recycle-able (from rain replenishment), whereas the salt from any terrestrial source is not. So salty rivers, if any, won't exist permanently. Saltwater lakes gain their salinity precisely because they have no outlet, so salt just gets concentrated by evaporation. I don't think there are any truly saline rivers throughout their entire length. Rare ephemeral runoff from emergent salt domes in desert areas. Freshwater rivers that drain into arid areas where combined evaporation and infiltration gradually reduces the flow to zero. These are more 'very brackish' than truly saline. The Amu Darya in Uzbekistan is one such example. I don't know the salinity of the Jordan as it enters the Dead Sea, but the river is reduced to almost nothing, whilst there are hypersaline springs, and sewage effluent from Amman draining into it. 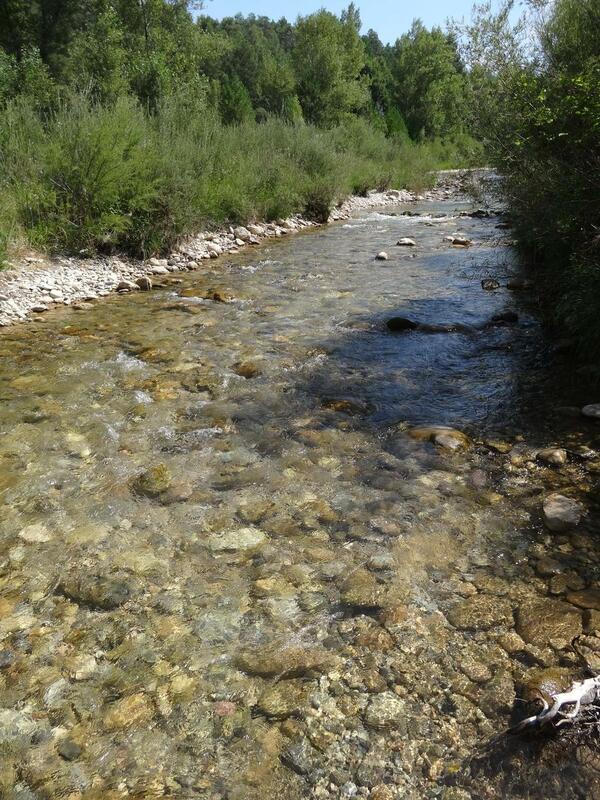 The only river I can think of that is very highly mineralized from source to sea is only about 3 kilometres long. It is an unnamed river from the volcanic crater on Savo Island, in the Solomon Islands (Southwest Pacific). It is also acidic and boiling hot - quite literally, for most of it's length. The already accepted answer is already covering the "real" answer as far as I'm concerned, and while you won't find many (any?) saline rivers in the traditional sense, we do have underwater "rivers" that kiiiiind of but not quite fit the bill. They're not saline rivers as I expect you envision, but I figure they could be an interesting "by the way though" answer to the question anyway. It stems from salty water spilling through the Bosphorus Strait from the Mediterranean into the Black Sea, where the water has a lower salt content. This causes the dense water from the Mediterranean to flow like a river along the seabed, carving a channel and deep banks. 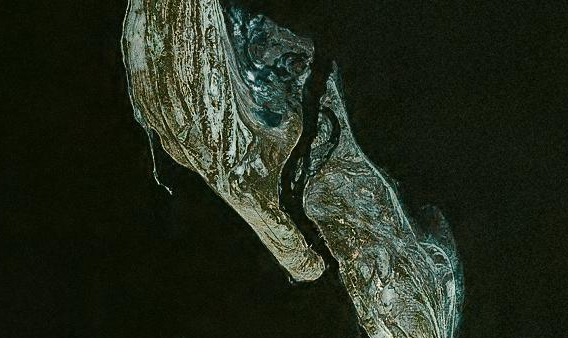 'It flows down the sea shelf and out into the abyssal plain much like a river on land,"
So much water flows through the Black Sea undersea river that it is estimated to possibly being the sixth largest river in the world. 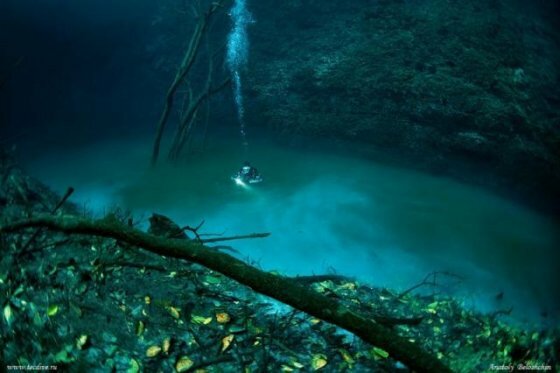 Another, perhaps more visually impactful example might be the Cenote Angelita in Mexico, and although this isn't a river at all, it looks very much like one. The Cenote Angelita is a heavily saline mass of water found at the bottom of a fresh water cave, with a layer of Hydrogen Sulfate separating the two watermasses, snaking around in cracks and layers that make it look like a river. As far as I understand it, the waters here are essentially static and unmoving, which has caused the heavier saline water to sink to the bottom, while the fresh water lies on top. Essentially the same as when you put oil in a cup of water. The Pecos River in Texas, USA may arguably fit the description of a "saltwater river". A point of argument is what is considered to be "saltwater". For comparison, here are some bodies of water and their salinity. Note though, that salinity varies based on where, and at what depth you measure it. For example, the Baltic Sea has salinity as low as 5,000 to 8,000 ppm at the surface of the central basin. The Pecos River is among the saltiest rivers in North America with salinity levels regularly exceeding 7,000 ppm at the Texas and New Mexico border and 12,000 ppm near Girvin, Texas. High salinity in the river has adversely affected the stability and biodiversity of the riparian ecosystems, as well as, the economic uses of the river and reservoirs. In general, natural sources of salt throughout the watershed cause the Pecos to be salty. If you look at the slides in this presentation you'll see that different measurement locations range from around 1,000 ppm to 12,000 ppm (it gives measurements in mg/l, but that is roughly equivalent to ppm). It also gives historical measurement graphs for some select stations. The presentation also highlights that there is a history of efforts to engineer a reduction of the river's salinity. 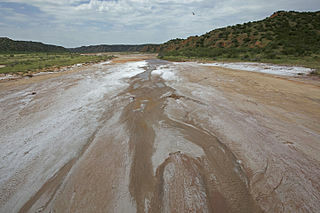 The source of the Pecos River's saltiness is not so much surface salt as it is subsurface sources in the form of saline aquifers that feed the river through salt springs, for example. This research paper suggests that although the Pecos was naturally salty, the activities of man have increased the salinity. The major activity is irrigation, through two mechanisms. One is the diversion of water for irrigation, which allows increased evaporation in the fields, and irrigation water that returns to the river with more concentrated salt content. The other is the depletion of freshwater aquifers through pumping. The Pecos watershed overlays both saline and freshwater aquifers, both of which have historically contributed to the riverflow. Man has ignored the saline aquifers, but heavily pumped the freshwater aquifers, reducing their contribution to the river, but not the contribution of the saline aquifers. This report is also good, and goes into much detail about the sources, both natural and human, of the Pecos River's salinity. Salinity is the greatest limitation on water use in the Red River Basin and is largely the result of naturally occurring salt springs in parts of the upper reaches of the basin (Keller and others, 1988). The salt sources contribute water with large (relative to potable water) concentrations of dissolved solids, principally chloride. At certain times and locations, the salinity of streams in the basin exceeds that of seawater (Keller and others, 1988). There are salty rivers in various places on Earth, but they are primarily found in arid regions. Since much of their flow comes from groundwater (which may be much saltier than rainfall), and evaporation from the river surface is high, it seems reasonable to me that they would be more likely to be saltier than rivers in wet regions that have large contributions from rainfall, and less net evaporation. These factors are magnified by human activities such as irrigation which happens in arid regions, but less so in areas of ample rainfal. Here in New York City we have a salt "river". 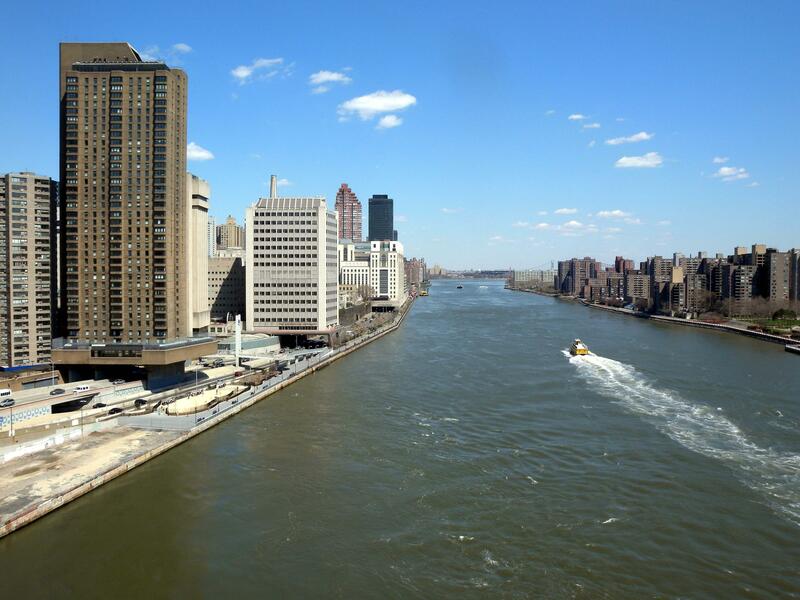 It is called the "East River" and it separates part of Long Island (Brooklyn and Queens) from the island of Manhattan and the mainland (The Bronx). From a hydrology perspective it is not a river tho, it is actually a saltwater estuary. There are salt water rivers in different places of the world where ground water flows in contact with salt layers. It gets its name because one of its originating currents - Fred river - comes from sources in Triassic lands with a high content of salts. The river is salty enough that its waters had been used for long time in Cambrils to obtain salt. However, Ribera Salada is actually salty just in part of its course, since mixing with other freshwater currents makes it brackish or nearly freshwater. Image from Wikimedia Commons. Credits here. Here in Western Australia we have many salt water streams running through farmland affected by dry land salinity. It's a huge problem where land cleared for agriculture has experienced rising water tables effectively bringing salt to the surface. This salt is washed into the creeks by rain and these streams are essentially salt saturated - far saltier than seawater. The streams generally only flow during winter though. Huge tracts of land are no longer arable because of the extreme salinity. There is an area with several salt rivers and wide salt streams that exists in Russia - it's in Yakutia (Sakha Republic), part of Siberia. According to science, millions years ago this territory was covered by a large sea. Later, due to uplift of the crust it was divided into many salt lakes in numerous cavities. And after the water has dried up - large stratum of salt remained inside the earth. So modern rivers and streams flowing through this stratum are fully saturated with salt. The Werra – a natural river – had and up to a certain degree still has at least a brackish water body. A portion of the salt content of the river comes from natural leaching, the greater part is passed by nearby potash industry. The legal threshold value in the 1940s was a salinity of about 0.5%. The value was often exceeded. 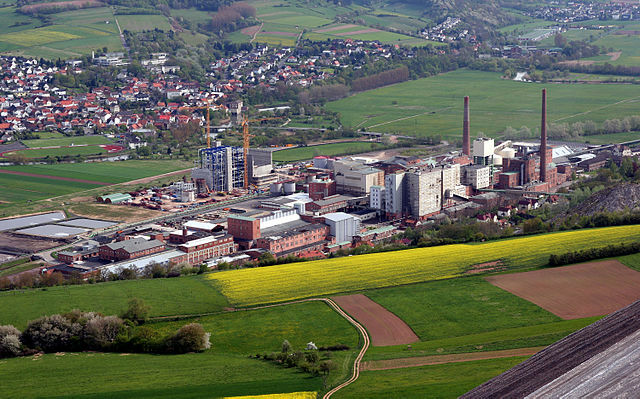 Later in the 1960's the underground dumping of the by-products was ceased and all the brine ended in the Werra. The salinity rose up to 4.0%. The ocean like salinity terminated the former (almost) freshwater habitat and changed it to brackish water habitat with a very low biodiversity: e.g. only one invertebrate (of former 60 -100) survived and two invertebrate halophile aliens were introduced. After the German reunification potash mining (a lot of mines were in the former GDR) declined and stricter limits were introduced. The salinity limits now are ~0.5 % and will be reduced to ~0.3% until 2019. The actual salinity seems to be ~0.33% (Source: Werra-Versalzung Gutachten p44/45). 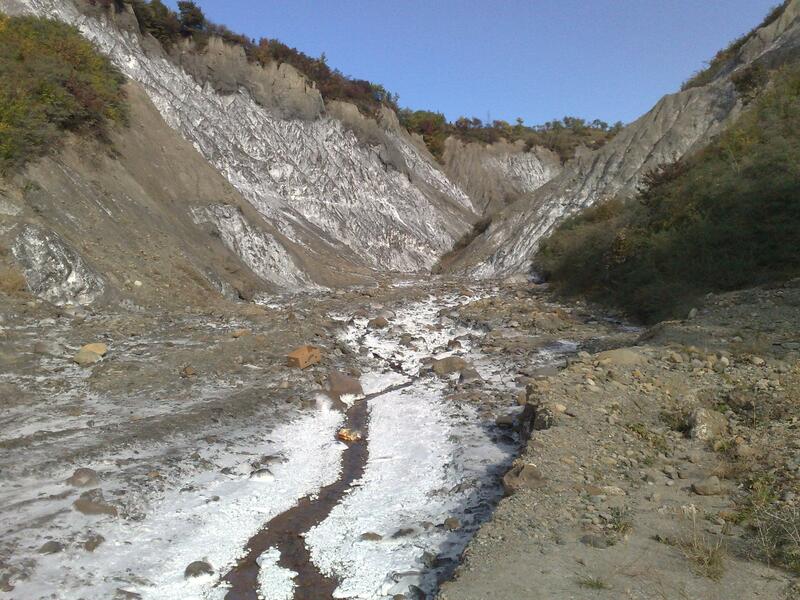 Beyond the answers above, here is a small river near Berca, Romania, where active mud volcanism and salt diapirism are widespread, explaining the high salinity of this water. Again, not technically a river, but a narrow strait connecting the ocean to a wider fjord behind it. As the tides go in and out, Saltstraumen does too. It is the world's strongest tidal current. There is also a hypersaline periodic water flow, which although a few times more saline than sea water, I might be hesitant to call a river. However, due to its high salinity (well above everything else mentioned here), I thought it was worth mentioning. It is called Blood Falls. 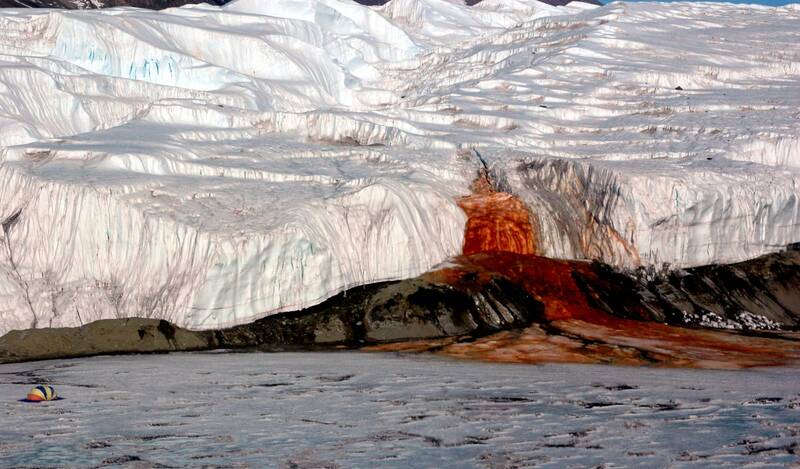 It is the periodic draining of a brine reservoir under the Tylor glacier in the Dry Valleys of Antarctica. Świna (note that while english wikipedia lists it as a river, both german and polish wikipedias are more ambiguous, for example polis wiki descirbes it as a "strait" of the Baltic sea): Świna (Wikipedia). There are specific rivers that sometimes flow inward called Tidal Bores. 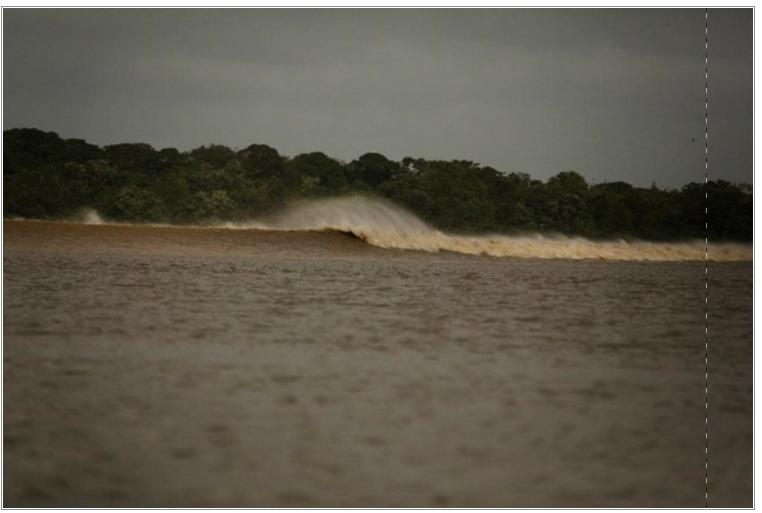 A great example of a Tidal Bore is the Amazon River. From my country there is indeed a saltwater river in the north western state of Rajasthan - Luni river. It is not salty from the point of it's origin but does become salty as it flows downstream. Looking at this book - Contributions to the ecology of halophytes one wonders on the accumulation of salt in these arid basins. Considering the basin is in proximity to the Great Rann of Kutch there were earlier conjectures that the atmosphere carried the salts as either particles or sprays of sea water. Wider acceptance of the origin of salt these days is due to the atmospheric decomposition of feldspathic rocks and leaching by rain water. There is a river in Arizona called the Salt River. In the article linked, it states the river is 'special' because It's salty. If you're still questioning my response, please read the article liked for more information. Not the answer you're looking for? Browse other questions tagged hydrology geography rivers salinity estuary or ask your own question. Are there any areas on Earth with purplish-colored soil/sand/rock/land? To what extent is hydroelectric power really renewable? Where do rivers like the Rio de la Plata end and the ocean begin? 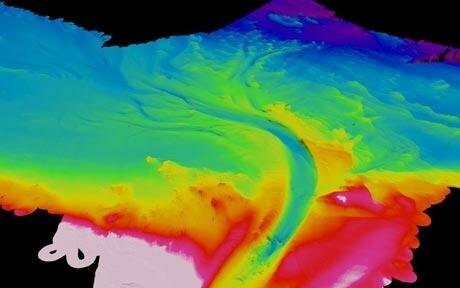 Is there a special name for along-course elevation profiles of rivers, and where you can you find them?